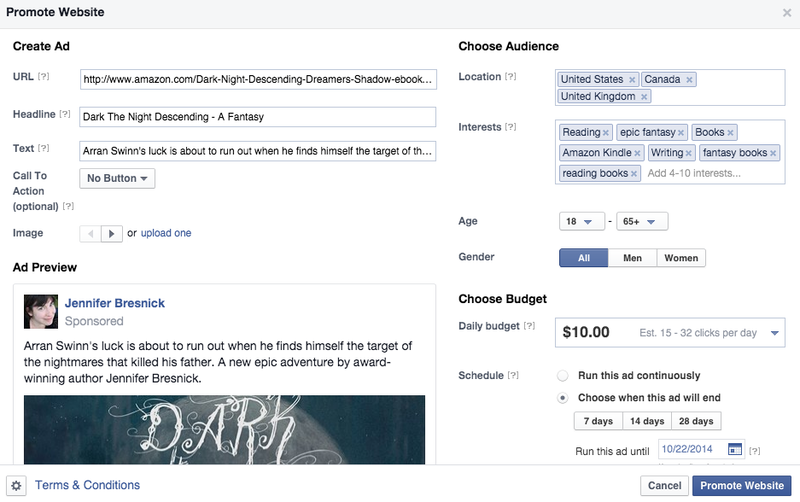 Do Facebook and Goodreads ads work for self-publishing authors? Web ads. Ugh. Flashy, annoying pop-ups and distracting sidebars; exhortations for products you don’t really care about; “targeted” pitches for lard clarifiers and chimney collars and one weird trick that will extend your life indefinitely in exchange for your first-born child. We all kind of hate online advertising, and yet internet ad revenues have reached $11.6 billion in the first quarter of 2014, according to one report. Eleven billion dollars. Eleven. Billion. So I guess someone must be clicking on them, right? With the launch of Dark the Night Descending, I wanted to see if maybe I could expand my audience beyond the current reach of my small (read: tiny) social media presence. I chose three different publicity methods: Facebook newsfeed ads, Goodread sidebar ads, and a Goodreads book giveway. I’m here to report on my results and answer that burning question: is it worth paying for advertisements? How much of that $11.6 billion dollars could I snag for myself? Over the past year or two, Facebook has gotten pretty rapacious when it comes to advertising. After all, that’s how they make their money. Their key demographic base may be wavering, but there are still a few hundred million eyeballs to capture. The advertising interface is very simple and intuitive. Creating an ad is easy, and setting your target audience parameters only takes a few minutes. You choose a daily budget, which will determine how many times your ad is shown to Facebook users. Based on my targeting, five dollars a day will get between 8 and 16 clicks, while 20 bucks a day might get me up to 65. Whether I run the ad for four days at $5 or one day at $20 is just a matter of balancing the math to get the most possible exposure. 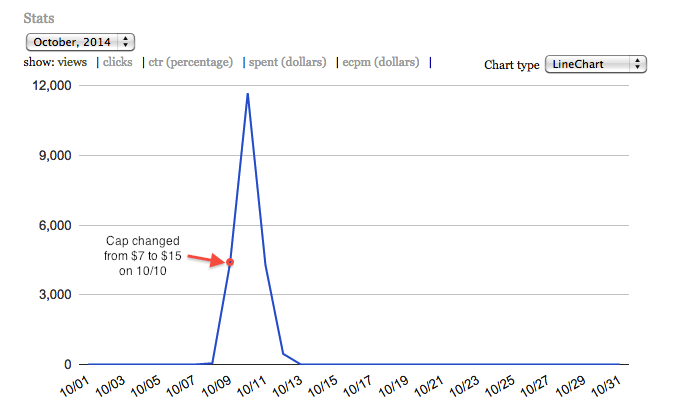 I chose to run the ad at $10 per day between October 7 and October 10. The results were mixed. From a statistics point of view, I did pretty well. I reached 5,392 users and garnered 47 clicks on the ad, which directed to the Amazon shopping page for Dark the Night. That’s a 1.33 percent click through rate. Salesforce says that the general CTR for the publishing industry on Facebook is .790 percent, so I’m well above average. People seemed interested in my offer, which is nice. But let’s look a little closer, because CTR isn’t what really matters. You could have a million people click on your ad without making a single sale…and that’s exactly what happened. Based on my KDP and CreateSpace sales manager pages, I can tell that none of those 47 Facebook users bought one of my books. I spent $24.40 on those clicks and made no money back. The Goodreads self-serve ad system is in beta testing, and it shows. I couldn’t create or edit an ad in Chrome or Firefox on my Mac at home because of browser issues, so managing the campaign was kind of frustrating. Still, the ad was easy to set up on my office machine (shh, don’t tell my boss). I purchased $30 worth of credit for my ad. At first, I set a daily cap of $7, because I wanted it to run for a while, but the ad was barely shown to users. After increasing the daily cap to $15, I got some good traction. Between October 8 and October 13, the ad was shown to 20,809 people. But I only got 9 clicks. Nine. That’s a CTR of .04 percent. No one bought a book, but on the bright side, it only cost me $4.50 total for the campaign. Goodreads has a lower average CTR than some other outlets. They state that you can expect between .05 and .5 percent. They also try to tell you that CTR isn’t what matters when it comes to their ads. The real measure of effectiveness is how many people add your book to their “to read” lists. I can’t say whether that’s true, because a) I’m running another small giveaway right now, which has led to many people adding my book through that venue, and b) even though Dark the Night Descending has about 450 users on its “to read” list, none of them have bought the book either. 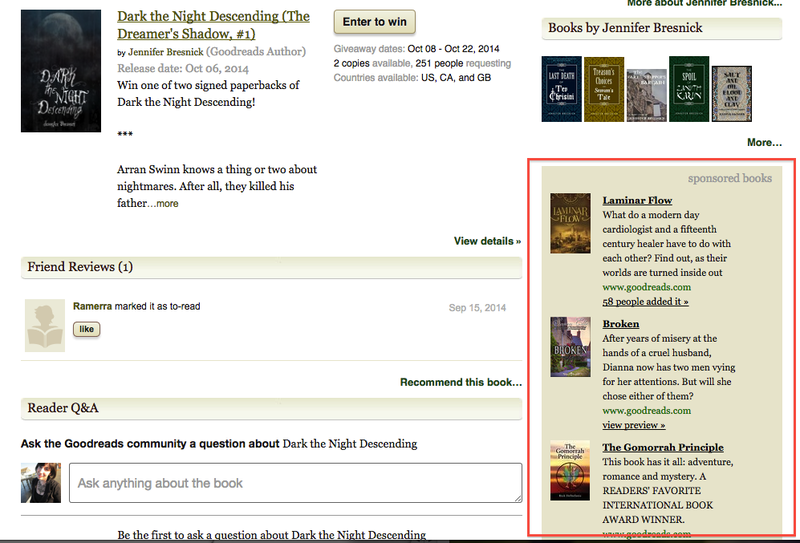 One of my major publicity initiatives was the Goodreads giveaway I ran a few weeks before the launch date. I got a whopping 765 entries for five free books, and 365 people added the book to their “to read” lists. I’m still expecting to make some sales from that over the next few weeks or months as people work through their reading lists, but you never know. I’m also expecting at least one or two of the five winners to write me a review, which might help to boost interest down the line. I spent about $80 on buying the paperbacks and shipping them to the winners (some of whom were international). Getting physical books into the hands of readers is a much more powerful connection than any ad could ever be, so I consider that more of a long-term investment. I would say this was the most effective strategy for increasing exposure and piquing the interest of people who are actively seeking new books to read. If you are working with a very small budget, paid internet advertisements on social networking sites (even reader-specific ones like Goodreads) are not worth the money. You’d probably be better off spending your cash on physical promotional items or book copies, or even a ticket to a reader/writer convention, and hopefully produce some reviews or some positive word-of-mouth. This study has plenty of limitations, of course. It was a relatively small experiment, and it certainly doesn’t include all possible outlets where readers congregate to look for new authors. There are tons and tons of free ways to promote your novel, and I would advise self-publishers with limited funding to seek out those avenues first. Hopefully, the money I’ve lost on this effort will provide some interesting data for other self-publishers. As you can probably tell, sales have been a little light for Dark the Night’s first week on the market, but for me, self-publishing is all about building momentum. That doesn’t happen overnight. I’m just going to invest a little more wisely in the future as I wait, work, and WriMo my way into finishing the series this November. Has internet advertising worked for you? Share your stories in the comments. ← Dark the Night Descending: Launch Day! Very true, I tried it for a few months, got a bunch of clicks and no sales. Honestly, my blog and copromote.com have done more for my sales than paid advertisements ever could. Very Valuable insights. Thank you for sharing your experience. I’ve done a few of these types of marketing offers as well, Goodreads, BookADay, Facebook (which I never actually SAW do anything) and I Tweet all the time. Not a great deal of return on the dollar spent, so Im saving up to be able to publish and work with an actual publisher. I love that you do the screen shots. It makes everything a little more understandable. I would hate to have to try marketing a fiction book and doing the whole self publish thing…it is SO MUCH WORK! The thought exhausts me. I would wonder about contests, seals of approval, local endorsements/reviews in the paper, appearances at the library…? Are there any groups in your area to co-market with? Like a mystery group, or a horror, or period books, or YA authors, or any other ones that you could get into for help? Do you use Constant Contact or other tracking software that might help you out? Maybe directly marketing to your previous buyers? Getting some reviews out? Those Amazon “free days” where you actually get paid per copy? Just a few ideas/ thoughts. This would totally wear me out! Thanks for sharing your experience with the rest of us. I’m just ending a KDP Select period, so I’m going to wait til that’s over and I can publish at Smashwords before I try any of this. I imagine Goodreads would be a better target audience than Facebook. Amazon also has a paid advertising program, but I haven’t read anything about how effective it is. Guess I’ll just have to do my own experiment to see. I also imagine all of this might be a little more effective for a non-fiction book rather than a fiction book. We learn by doing, but articles like yours really help make qualified decisions. Thanks again, Jennifer. Excellent article, I got similar results. I also tried a combination of Twiiter with Amazon Giveaways. Had hundreds of downloads, but not one review or increase in sells from the campaign. interesting article, I often wonder if the time spent marketing is a waste of time.